Every Tuesday afternoon, an Adventist school in northern New South Wales, Australia, takes students to play in the bush. From 12:30 p.m. onwards, the students at Manning Adventist School in Tinonee go outside and enjoy a few hours of unstructured play out in nature. 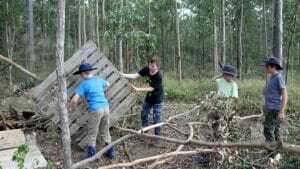 Activities include weaving, mud play, bushwalking, slacklining, studying insects, and building dens. Head teacher Dianne Hillsdon is the leader of the Bush School initiative. Hillsdon first heard about unstructured outdoor play during a previous role as Adventist Church education director in Western Australia. It captured her interest, and she later enrolled in training to become an accredited Level 3 Forest School Leader. This involved studying for more than 12 months and traveling to the United Kingdom twice to complete the course. The qualification allows for Bush Schools to happen with any age group right up to adults. She is the only trained person in Adventist schools across Australia. Bush School currently runs one afternoon a week, but Hillsdon would like to increase it to lunchtimes every day. Children have been asking for more, she said. “I’ve worked in Adventist schools for 30 years, but this is the best thing I’ve ever done,” she said. “I’d love to gain a Level 4 accreditation, train other teachers, and help implement this program in all of our New South Wales Adventist schools.” The program aligns with curriculum outcomes and can replace other not-so-exciting subjects.